Chiverton House is a fine Victorian Cornish granite house. With it's timeless elegance, it echoes the romance of yesteryear and combines it with the comfort and style of today. 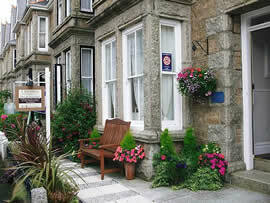 The guest accommodation is ideally situated in a quiet road just off the promenade. It's a short walk to the main shopping centre, public parks and gardens, cinema, museums and art galleries. It is also very convenient for the main line rail station, coach station and harbour. There are 6 rooms arranged over the first, second and third floor. 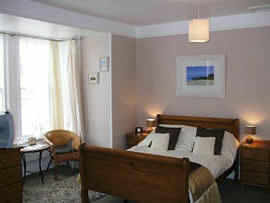 All of the rooms are stylishly furnished and have en suite facilities. They are centrally heated and equipped with wash basins, shaver points, hairdryers, tea and coffee making facilities, colour televisions and alarm clocks. Freshly cooked breakfasts with local produce being used where possible are the order of the day. Breakfast options include traditional English breakfast, vegetarian breakfast, continental breakfast and fresh fruit platter.